An investigation by the Bulgarian General Directorate Combating Organized Crime cybercrime unit, has led to the arrest of 4 suspects. The 4 are suspected to have come up with a sophisticated and organized scheme that allowed them remote access to casino and gaming halls machines. In so doing, they were able to control the results from slot machine games. The crime group of 4 is said to have had a system where each one had a specific role to accomplish. While one of them pretended to play on the slot machine, another one would secure the remote access and manipulate the devices. Another one crafted electronics which remotely controlled the software of gaming equipment. They hacked and defrauded many casinos and gaming halls making huge profits before they were finally caught. They were arrested just after they had collected their profits from another casino which they hacked. In their possession was a lot of money and devices that they used in their operations. They are set to be presented to court and charged in accordance with the Bulgarian law. The Roselli Brothers used computer hackers to get data from the credit systems of casinos. They would then steal identities of those with good credit. Once that was done, they would deposit $50,000 into their accounts. After receiving credit lines, they would then withdraw larger amounts of money. They were able to withdraw millions of dollars and until their death, they were not discovered. This happened between 1995 and 2000. It would be a lot harder to hack casino systems presently. In 2012, a professional poker player, Phil Ivey, Jr. was accused of cheating. He was accused of using tiny imperfections on the back of cards to determine which ones they were. This method of cheating is known as “edge sorting”. Crockfords casino believed that the player used this method to win $11 million. According to Ivey, edge sorting is simply improving your chances of winning and should not really be classified as cheating. In 2014, he won $9.6million at a different casino. The casino wouldn’t pay him. Phuong Quoc Truong brought together a group of 30 card counters and blackjacks in 2011. 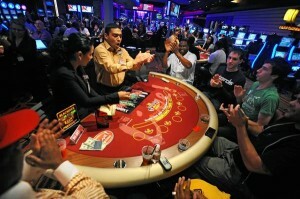 The group scammed casinos in Southern California. Instead of shuffling, the con dealers simply made the cards produce a deceitful sound by tapping the edges. The order did not change. This made it possible for them to decide who was going to win. After the cards were rightly placed, one would pretend to be smoking a cigarette. He would in fact be using a microphone to give someone on the outside information on what was on the table. That person would offer the smoker tips on how to place bets. The smoker would, in turn, use his cigarette to signal the other gang members who were also players. In 2012, a New York criminal gang of 50-70 people took on Ohio. The pretend players would get into busy roulette games and stake very low. One of them would distract the dealer while another one hid away casino chips of specific colors. They would then excuse themselves and secretly hand the chips to other players. These players would then go back, use them to buy more chips for better rates and cash out. The group would make thousands of dollars per job. Fortunately some of them were eventually caught and punished. Les Prince Casino made loses of up to $88000 in 2011. 4 people used invisible ink marks on cards. One of them, an employee of the casino, would use special marks for different cards. The marks could only be seen using special contact lenses. The operation was easy to implement because of the casino employee working for them. The rest of them, with their special lenses, knew exactly what cards they were playing. The casino only grew suspicious after they came back days later for a second round. In 2014, the actor Ben Affleck admitted that he was no longer allowed into certain Las Vegas casinos because of card counting. While it is not necessarily illegal, casinos frown on it and if discovered, they take action. This method was made popular in the period of 1979-2000 by the MI T Blackjack. They got millions of dollars from casinos.